I roasted a pie pumpkin while also roasting a spaghetti squash for dinner last week. But why? How? Easy! 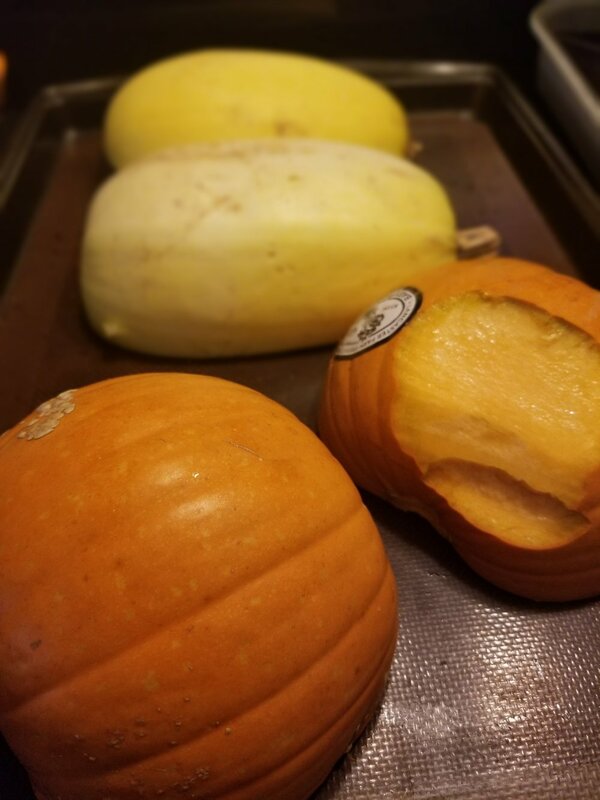 Cut any type of squash in half and then roast cut side down on a baking pan. I roasted mine for 50 minutes on 425 F.
Yes, it seems time consuming but I also mowed the lawn, did dishes, and finished up some laundry in that time frame…I also made dog treats from the pumpkin guts! So save yours from pumpkin carving or other baking activities, and read about that recipe below. So, I let the pumpkin cool for about 20 minutes, and then I scraped the soft insides from the skin into my food processor. You could also use a blender. I pulsed it until smooth, then placed it in a mason jar in the fridge, to be used in a delicious pumpkin apple cake. A small pie pumpkin yielded about 1 2/3 cups of pureed pumpkin. 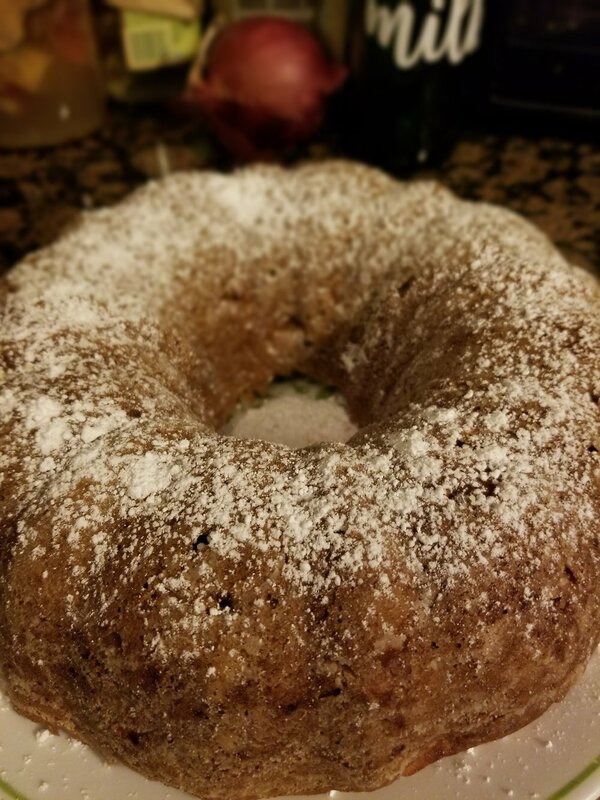 The cake turned out even better than I could have imagined; I used King Arthur Gluten Free Flour in place of white flour, coconut oil where the butter was supposed to be, and freshly grated ginger as I was out of powdered ginger. The spices are PERFECTLY on point in this recipe for a fall treat you will absolutely love. I also doubled the apples used. Definitely bake this in a bundt pan (I found one for $2.99 at 2nd Avenue Thrift Store), with all of the apples in it, this cake needs the extra air flow while baking to ensure it bakes evenly. Using fresh pumpkin puree makes this recipe even better, but you could also use canned. What’s better than perfectly seasoned pumpkin apple cake? How about dog treats made from the pumpkin guts and seeds? I took the innards from the pumpkin and pulsed them in my food processor. They didn’t break up easily, so I decided to mix the entire recipe in the food processor. Pumpkin seeds are high in essential fatty acids and antioxidants (good for overall healthy skin and fur), and the oils in pumpkin flesh and seeds are believed to support urinary health. They are also an excellent source of Vitamin A, beta-carotene, potassium and iron, and may even reduce the likelihood your pet will develop cancer. Combine all ingredients in a food processor until well blended. Add more flour if dough is too sticky. Flour your baking sheet well, then turn dough onto sheet, rolling to about 1/4” thickness. A wine bottle works great for this if your rolling pin doesn’t fit on the sheet. Sprinkle with raw oats, score the dough where you would like the treats to break into the appropriate size for your dog, and then bake on 425F for about 45 minutes, leaving the sheet in the oven, with the door closed, after turning it off to allow it to cool and dry further without burning.